Here's a simple assignment that's a good example of one thing digital often does better than film: the classic north-facing window-light portrait. North light—long favored by painters—can be particularly beautiful in many types of weather, but it's often not very bright on the indoor side of a typical window. A film of ISO 200 or less often made for a somewhat uncomfortable balance between slow shutter speeds, motion blur, and apertures that were a bit too wide. But with a DSLR, ISO 800 or 1600 (particularly if you also have IS of some sort) can be very liberating, allowing you more latitude for experimenting to find the right aperture while still keeping the camera off a tripod and not risking subject motion blur. This is the very light that many studio portrait lighting setups are attempting to emulate. Having a few nice window-light portraits under your belt can "calibrate your eye" to what you're looking for in the studio as well. 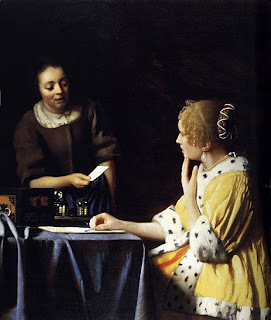 Jan Vermeer, Mistress and Maid, c. 1666–7. Try it. If you like what you've done, leave a link to your picture in the comments—I'd like to see, and I'm sure others would, too. The camera was a 5x7" Press Graflex SLR. The film was Fortepan 400. I think you'll get a kick out of this one: it's B/W and shot on film even! The one on the right. It was shot for a business magazine. This technique is valuable for journalists -- the fastest lighting "studio" around. Gimme a window, a white wall, and two minutes, about all the CEO will give you anyway. The woman on the left demonstrates the other great quick portrait studio -- open shade. It's the same in the south hemisphere? Or we have to change to Southlight? Yes, for you in Argentina, south light. "about all the CEO will give you anyway"
You could try a trick that's worked for me. Take along a small print of Karsh's portrait of Winston Churchill. Show it to the CEO and tell him that Churchill gave Karsh ten minutes, so you're going to ask him for ten minutes too. It works like a charm. Here's an example of north window light from a few months ago. I think it was technically east light, but the window was in a hotel room in an urban canyon in Chicago, so the overall effect is the same. I started a wee portrait project a few months ago, all using available light and preying on my friends kindness and willingness to pose for a few minutes. Part of the point was to get a good set of pictures of my friends and part of the point was to challenge myself to find decent light in unfamiliar spaces, so I've been shooting in various people's homes and just finding the light that works there, when I'm there. So lots of window light, facing in various directions, but trying to find the windows that are lit from an open, sunless sky (north is great all the time, but east facing or west facing works well too, depending on the time of day) Basically anything that's available is working well. I've been trying to work quickly, so available light is key to that as well - each session lasts at most 10 minutes but many of them were just a couple of minutes and we were done. As you mentioned, being able to bump up the ISO to get enough light is a real boon for working digitally. I doubt I could have got many of these as easily, without that flexibility. I admire both: Zeiss on digital camera and north light. Thanks for the lesson! On Karsh and Churchill: Churchill was pissed that he had not been informed he would have to sit for a photo and sat ipatiently puffing on his cigar. Said Karsh "I stepped toward him and without premeditation, but ever so respectfully, I said, “Forgive me, Sir” and plucked the cigar out of his mouth. By the time I got back to my camera, he looked so belligerent he could have devoured me. It was at that instant I took the photograph." This is a portrait of my cat made with window light, probably more NW than N, and with no reflector. Made with an Olympus C7070 at ISO 400, which is quite noisy on that camera. Still, it think it turned out pretty nice. could anyone recommend a book on portrait lighting? Here's another window light portrait. Bronica S2a (6x6 SLR) with the new Portra 160VC. The chickens start laying again in the spring only after a certain amount of daylight is present. Shot from a north-facing window, with light bounced from the white house next door, with a Pentax *ist DL and Pentax-M 50mm. I particularly like the shots of Mojito and the thumb-sucking, baby cap wearer. Cute! This shoot was a lot of fun. Shot with a 50mm lens in a Cafe with a wonderful, almost full length window. A few more shots at the same location here. Does it have to be a Northward facing window though? Or will any window that does not have strong direct sunlight coming through do? In my case it's The Westernlight Portrait. The sky outside is hazy and cloudy. This was more 10 feet away from a west facing window light after 4 o'clock. There was light bouncing all over the place. I think it ends up working, mostly. Mike, if you have a west facing window and you shoot in the morning, will that be a similar kind of light to North facing light? 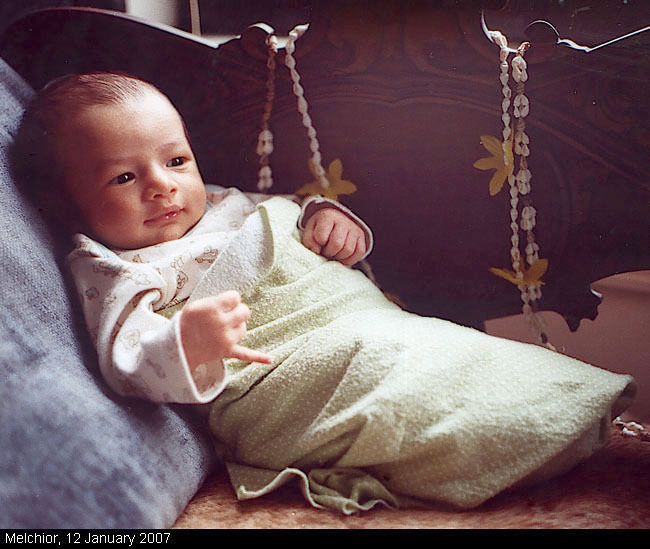 try Lighting For Portrait Photography by Steve Bavister, published by RotoVision. I got my copy from Borders in Perth WA so you should be able to get in Newcastle. Here is my picture. I had no foam core nor a white sheet.. Bit of blue bouncing off the wall..but it works for me. Be warned. It is a largish file. I took this photograph at Buffalo Bill's Birthday Celebration at the Buffalo Bill Cafe/Museum close to his gravesite on Lookout Mt. in Golden, CO. Oh, yeah, and give a quick browse over my blog. I have about 4 very loyal readers, including my Mother, who has very nice things to say about it. Your picture bears a lot of resemblance (at least in terms of the light) to the Vermeer painting I included with the post, doesn't it? Oops. I sent the wrong file,(don't ask me how that happened) Directional light yes (the overhead light was cut) but certainly not the "trapdoor" northlight set up you were talking about. Here is a better example if it ain't too late in the day! http://kURL.de/Thisone both for window-lightning as well as related to the appreciated music-topics on your site, Mike. http://kurl.de/secondone only for window-light, three year old picture of my son. The use of the Vermeer painting reminded me of how much I enjoyed the movie Girl With Pearl Earring. Colin Firth seemed to truly capture Vermeer's personal struggle to get the light he saw onto the canvas. I recommend it to anyone interested in the visual arts for this reason alone. Can you send that again and either link it or break the URL over two lines? One of the oddities of Blogger is that it runs URLs right out of the text box. Thanks. I'm not sure which Paul you meant, but here's mine (next to another one that I did at the same session). The ones I referred to are the first two pictures on the log. The second one is a larger file but has a touch more fill light and is lightened up a bit. I think it terrific to be able to light somebody with a single source. At the risk of sounding didactic, outdoors on an overcast day one can acheive a lovely result with a black flag over your subject's head and another one close in on the side of the face. The first to cut the top light and the second to handle the sidelight. ( A tree will work too or a doorway). Add a bit of flash or whatever you are working with (or not-in keeping with the theme of staying simple) and there you go. This has nothing to do with "Rembrandt" lighting, and I hope I am not too far off topic, but do you recall the scene in" Sophie's Choice"
where the Meryl Streep character is crouched in the basement of the German officers house? Nestor Almendros had the courage ( I use that word intentionally because it was an expensive production and one is expected to use most everything in the truck) to light her with a single source. One light. Just like you recommended in your excecise. Only difference is you chose the sun. Do a Google search on "Vermeer camera" and see what you come up with. It's a fascinating sidelight of artistic detective work. I never heard the reason North light is better than South. I am guessing it is because it is more stable? And less hard when the sun is out? Mike? FYI triple-click works in Firefox 1.5.0.10 as well. The scan is the dog, forgive me that. Note, that instead of the reflecor I 'used' a small window behind me overcast by me. 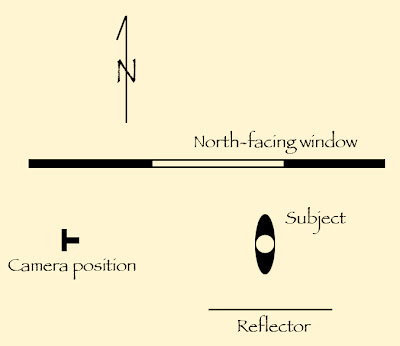 My understanding is that north light is superior because in the northern hemisphere it is never direct. Unless you are right on the equator the sun will always be on the south side of your house. A north window will be lit by the sky, not by the sun. Because the sky is a gigantic light source, relative to the sun (which is tiny and hard), the north light is super soft, while still directional. Okay, I live only 3 degrees north of the equator and have a north facing window. Is there anything special i need to compensate here? Thanks for the lesson too. "Northlight" doesn't have much meaning at the equator. What you might be looking for is "Eastlight" in the evening, or "Westlight" in the morning. The benefit comes from having the illumination come entirely from skylight. An overcast day also works! "Unless you are right on the equator the sun will always be on the south side of your house." A slight correction, please. Because of the 22.5 degree tilt of the Earth's axis, at various time of the year, the Sun will appear to rise from a location North of East and set North or West (if you are in the Northern hemisphere). The effect is not confined to just those who live south of the 22nd north parallel, either. If you think about it, folks above the Artic circle will have at least one day a year, in which the sun, during a 24 hour cycle, will appear to move through all compass points in the sky. I won't bore you (too late!) with all the celestial mechanics, but suffice it to say that a north window in the northern hemisphere is not immune from getting some direct light at least for a part of the year.